Vienna. What a city! Amazing architecture, exciting history, long-lasting tradition, incredible ubiquity and purity, stunning coffee houses and classical music… These are just few of the famous features of Austrian’s capital. In this beautiful place, the “European Youth for EU Youth Strategy” project was organized. WYA had a great opportunity to gather 50 young leaders and encourage them to engage in political processes for youth in their countries. The Brussels team arrived on Friday morning with worried eyes. Our newly appointed Director of WYA Europe had promised us nothing but blue skies and summer temperatures but looking at those grey clouds and hiding under our umbrellas, it seemed more like wishful thinking. This, on top of some complications at the airport meant we were already off to an eventful start. In an average sized room, an extraordinarily large number of different nationalities were starting to gather together. One by one, participants from Albania, Austria, Belgium, Croatia, Italy, Spain and Lebanon started to come. Babbling was slowly filling the room and the program officially started. Elisabeth gave an introduction presenting the important facts about WYA history and the tools we use to defend human dignity. Coffee break followed, and the sun had come out at last – it was a time to get to know each other. To break the ice, our introduction game was based on the exchange and replenishment of our paper Facebook profiles. We all ended up with our cards filled with funny statements or nice wishes, depending who wrote on our “wall”. Break, and then presentations on the “Introduction to EU Youth policies” and “Implementing Youth policies” followed. We ended the first day with many new acquaintances, information and full bellies. Actually, some of us even ended it with a ring on their finger. But that’s another story to tell. If we enjoyed the first day, the new one brought even more enthusiasm. 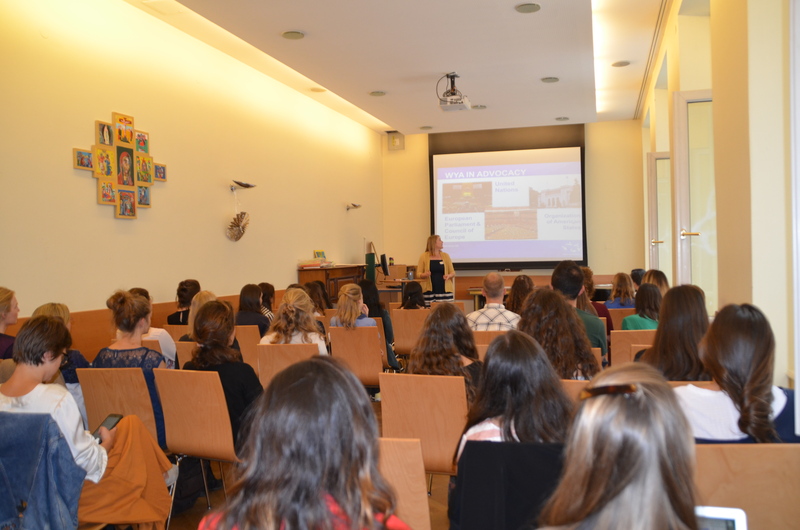 Our first workshop was given by Gudrun Kugler, the founder of WYA Austria, first Director of WYA Europe and a politician (an ÖVP candidate in her electoral district to the National Council). What she gave us, cannot be replaced by any article, book, or oral submission – Mrs. Kugler told us about her experience in politics and gave us tips on how to fight for our own beliefs. One of the main thoughts was that we should never underestimate nor overestimate the power of ideas. Plus, if we have the triple package for success, (superiority complex, inferiority complex and endurance availability to stick to our goal for a longer time) we can be sure we will leave a mark in the world. Her experience encouraged many of us, since she has a successful carrier but also a family life. We realized that Mrs. Kugler is a living example that, with enough support, women can achieve both and give their contribution to the world. We continued our day with a training from our WYA Director of Advocacy, Antoine Mellado. Antoine also presented his longtime advocacy experience at the EU level which gave us good basics for the focus groups about the needs of youth in Europe. 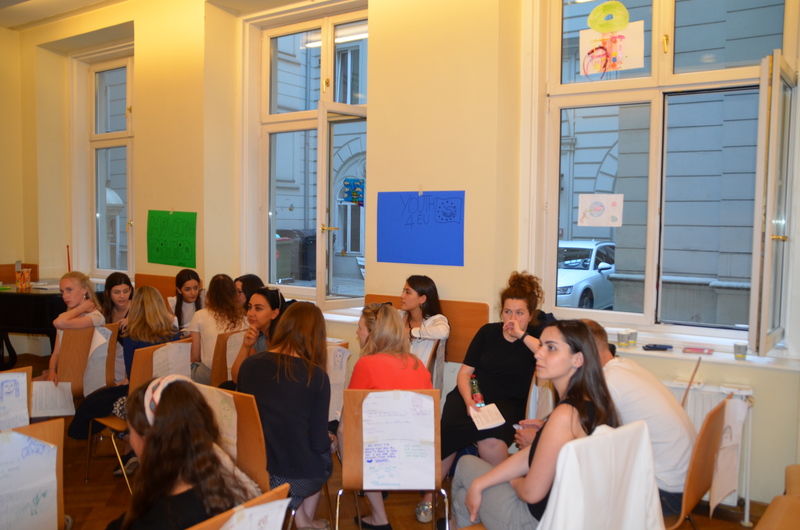 After discussing the greatest needs in fields of employment & entrepreneurship, social inclusion, participation in civil society, education, health, volunteering and creativity & culture, groups started preparing a position paper on the needs of youth in Europe. With our foreheads wrinkled in deep thought, our minds went to work. Making an agreement about topics that were so huge and important wasn’t an easy task. Still, we made it, and on Sunday the position paper was done, and our mission was completed (at least for this project). Surrounded by smiles and feelings of pride for a job well done, we once again went to visit the city center to take advantage of the time left for socializing and enjoying the sun – which had actually come out to shine for us the entire weekend.